I took this photo yesterday afternoon when the Husband and I went to pick up BBQ plates at the annual fundraiser that the Immaculate Conception parish in Tres Pinos held. Talk about yummylicious! It was the parish's 77th year, I believe. And, the cooks, chefs, bakers, and assistants certainly gave the touch of love to their barbecue chicken, pasta (rigatoni with marinara sauce), wedge of lettuce with Thousand Islands dressing, garlic bread, and a piece of pie. My lunch came with a slice of cherry pie, the Husband's, apple pie, and the Mama's, apricot pie. If you haven't gone to this fundraiser yet, try it next year. 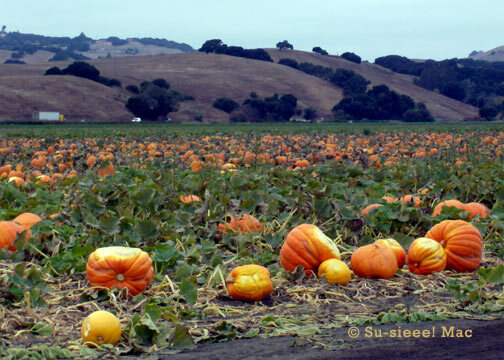 If you're from out of county, you can tie it in with some other splendid activity, such as skydiving, hiking at the Pinnacles, wandering around San Juan Bautista, checking out the Swank Farms corn maze, doing the wine trail, or simply pedaling or driving the back roads on a Sunday autumnal day. The last three years, this BBQ fundraiser took place the day after the San Benito Olive Festival. Hint, hint. 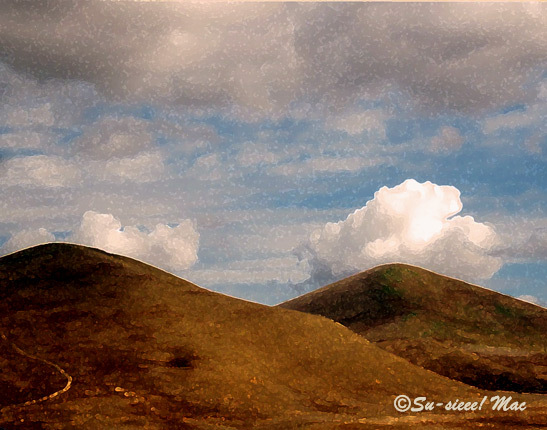 Speaking of Fall, notice the sprouts of green on the top of the hill on the right. Cool, huh? These hills are across from the Immaculate Conception Church. The photo was enhanced with Photoshop art filters, in case you're wondering. See you tomorrow. Maybe with photos from the San Benito Olive Festival. 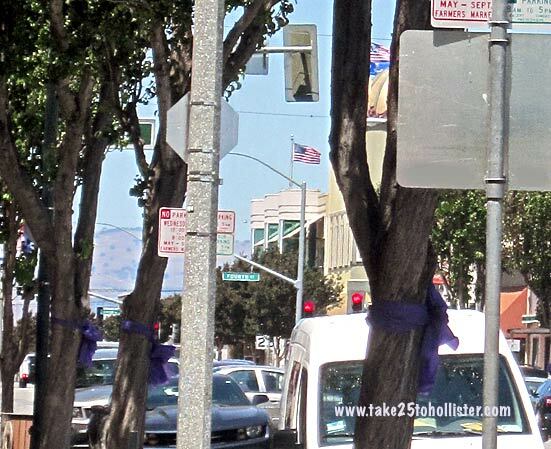 Downtown Hollister is swimming in purple to support Relay for Life that's taking place this weekend at the San Benito High School football field. 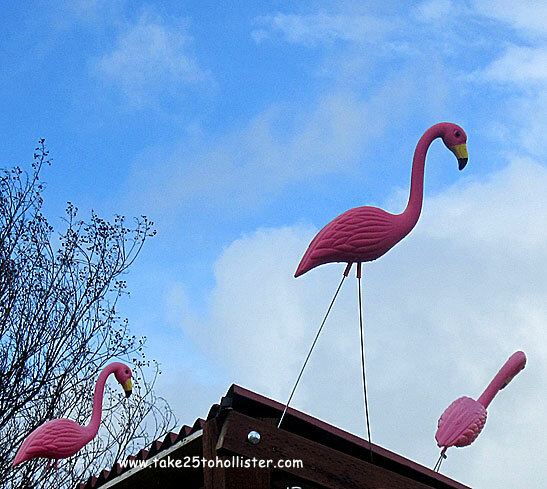 This local annual event is a fundraiser for the American Cancer Society. Participants form teams and each member takes turns walking around the track for 24 hours from Friday evening (July 31). According to the Hollister Relay for Life web page, 27 teams and 198 participants have raised nearly $56,000 so far. For more information about this event, click here. 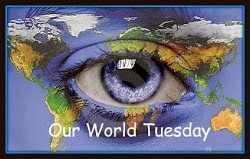 Today I'm participating in Our World Tuesday. If you'd like to join or check out posts by other participants, click here. A local judge, a school superintendent, and an organic chicken and walnut farm couple. What do they have in common? 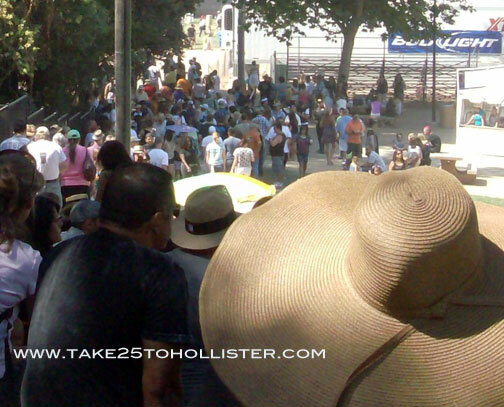 They are all alumni of the Hollister High Class of 1971. Ha. I bet you thought I was going to tell you a bar joke. Well, there is a bar if you happen to go to the Class of 1971 Scholarship fundraiser this Saturday, July 12, 2014, at the Bolado Park Golf Club. For the last seven years, the 1971 Balers have held an annual luncheon and silent auction as their major fundraising event for its scholarship fund. Since 2009, they have given $12,000 in scholarships to 10 Haybalers who have continued their studies at a college, university, technical school, or vocational school. 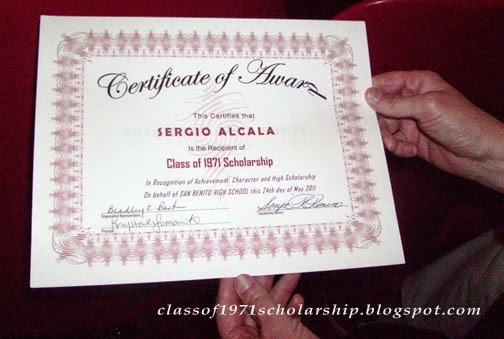 To learn more about the scholarship, check out the Class of 1971 Scholarship blog or this article at Benitolink.com. The Class of 1971 Scholarship fundraiser is from 12 noon to 4 PM this coming Saturday. The cost of tickets is $25 per person. Tickets can be purchased at the door, but a heads-up would be appreciated by writing to Rudy Bermudes at rudyb50 (at) hotmail (dot) com. The Bolado Park Golf Club is located at 7777 Airline Highway, about a mile south of Tres Pinos. 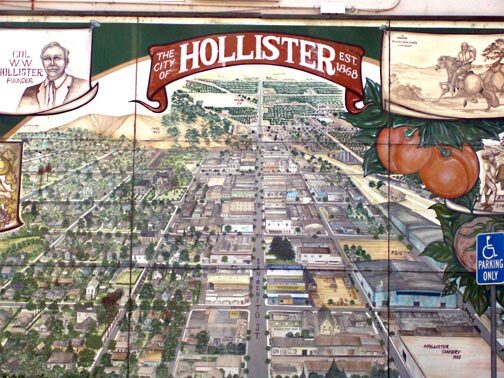 So that the FCC doesn't get on my case, I must disclose that I'm an alumnus of the Hollister High Class of 1971. Go Balers! 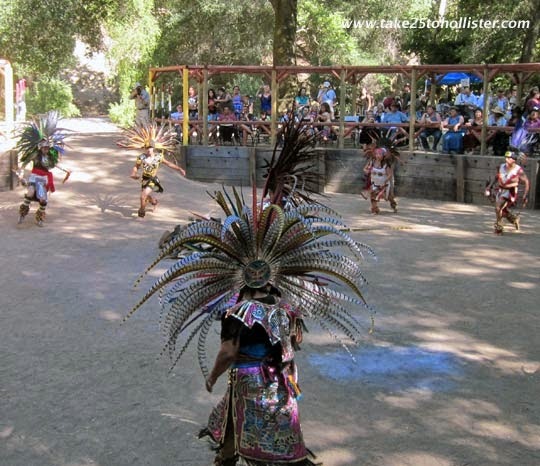 This Saturday, July 12, 2014, from 1 to 5 PM, the 18th Annual Storytelling and Indigenous Gathering will be held at Indian Canyon in Hollister. Story tellers and artists of the Ohlone, Chumash, Aztec, and other indigenous communities who will entertain and educate the audience with traditional and new tales of their culture and heritage in words, music, and dance. The annual gathering is a fundraiser for Costoanoan Research, Inc., a non-profit group based at Indian Canyon. Admission to the event is by donation. Amounts suggested are $20 for adults and $10 for students. Children under 12 are free. A tri-tip lunch will be available. A donation of $5 to $10 per plate is appreciated. 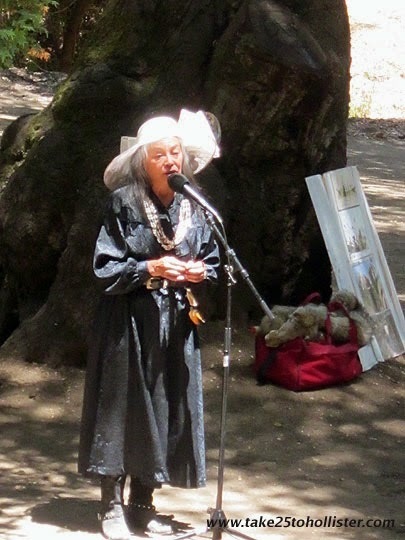 Indian Canyon is recognized as "Indian Country" by the federal government, and is under the stewardship of Ann-Marie Sayers, Tribal Chairwoman of Indian Canyon – Costanoan Ohlone People. 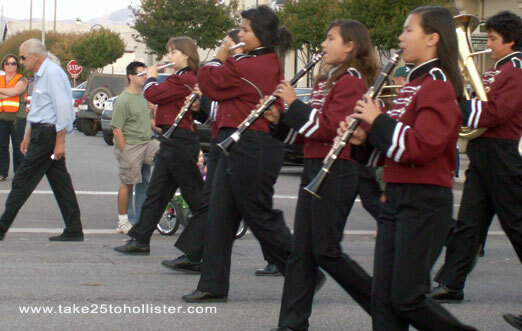 The venue is about a 20 minute drive south of Hollister via Cienega Road. For more information about Indian Canyon and the Storytelling and Indigenous Gathering, please head over to this link. If you'd like to read about my experience at last year's event, please click here. 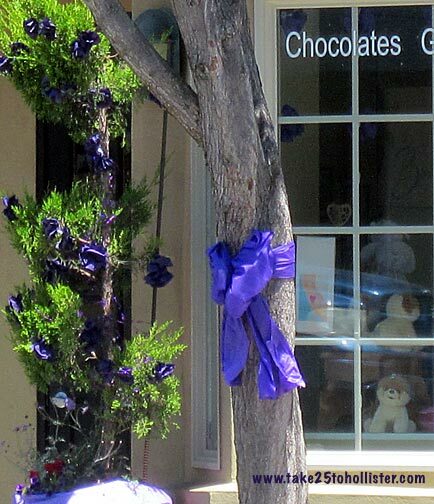 Quite a lot of holiday things happening this Saturday in San Benito County. Who knows who you might meet on Saturday. (Hint: Ho! Ho! Ho!) Which events will you check out? Sponsored by the Hollister Youth Alliance, the free event will feature local organizations that offer free or affordable health care, legal, education, and other services to individuals and families. A food and toy drive will also take place. Santa Claus will stop by the fair for photos. 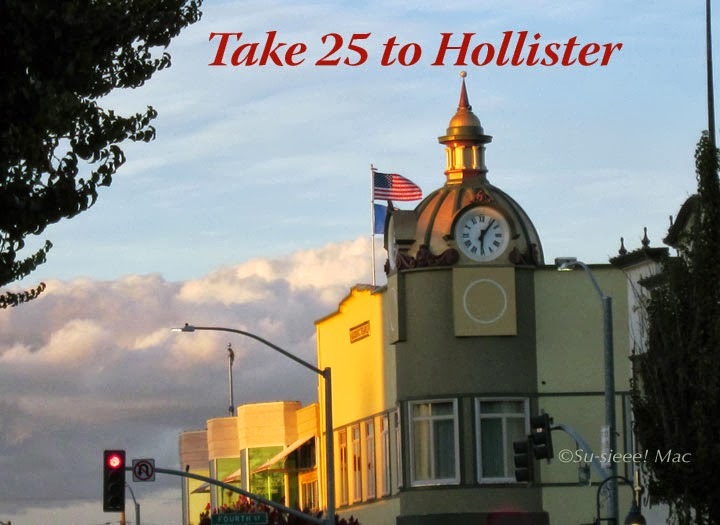 When you visit any of the participating shops, galleries, salons, restaurants, and more in Hollister, San Juan Bautista, and Aromas on this day, you can enter a raffle to win one of 26 baskets of local goodies. For a list of participants, click here. B&R Farms will also be having an open house on 12/14 and 12/21. 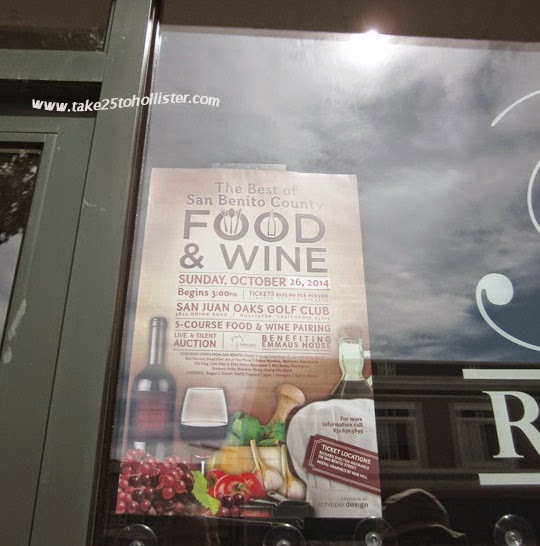 San Benito Bene will also have samples of food pairings on 12/14 and 12/21. 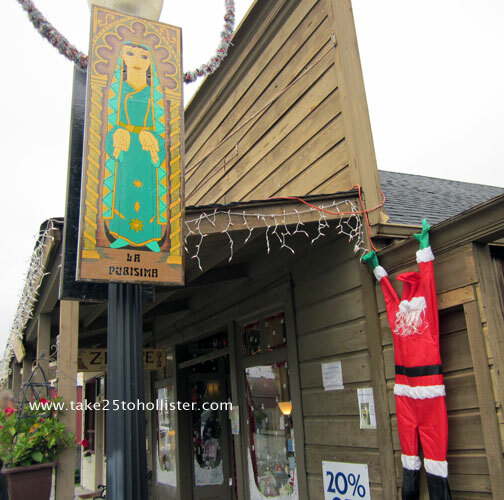 Shops, restaurants, and other businesses throughout San Juan Bautista start off the season of holiday cheer. Prints, pottery, ornaments, wooden toys, cards, and more created by local artists and artisans are on sale Wednesday, Thursday, and Saturday through 12/ 21. This free event will feature art work of more that 175 San Benito High School artists, which will be available for sale. Live entertainment, demonstrations, and workshops will also be part of the day. Free refreshments will be on hand. ARTS OUT LOUD will be on Sunday, 12/8, too. 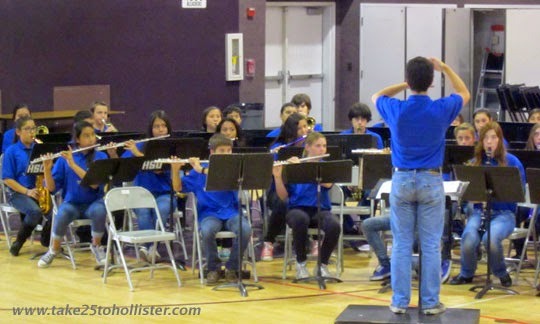 Mr. O's Academy Jazz band and Triple Creek will be performing. Tickets are $5/person and being pre-sold by members. For more info, call Cindy at 637-0362 or email her at acbiese@ymail.com. A Victorian holiday celebration. To check out the schedule of activities, click here. 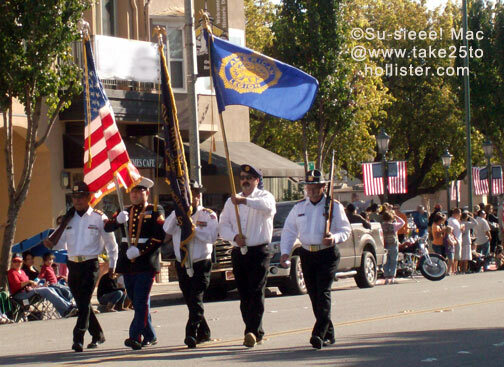 The parade winds through downtown San Juan Bautista. How often have you heard -- or said it yourself -- there's nothing to do around here? Ha! Can't say that tomorrow, Saturday, October 12. You can pick and choose of things to do, even at this late date. Feel like taking part in a run? Since 1989, San Benito County Behavioral Health has hosted a 5K Run/Walk and 10K Run to bring awareness to the problem, as well as prevention, of alcohol and drug abuse. The races start and ends in San Juan Bautista. 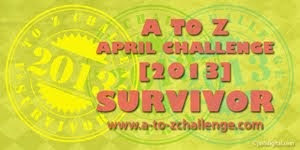 You can still register to enter on Saturday. The event hours are 7 AM to 12 PM. For more information, including the maps of the runs, click here. 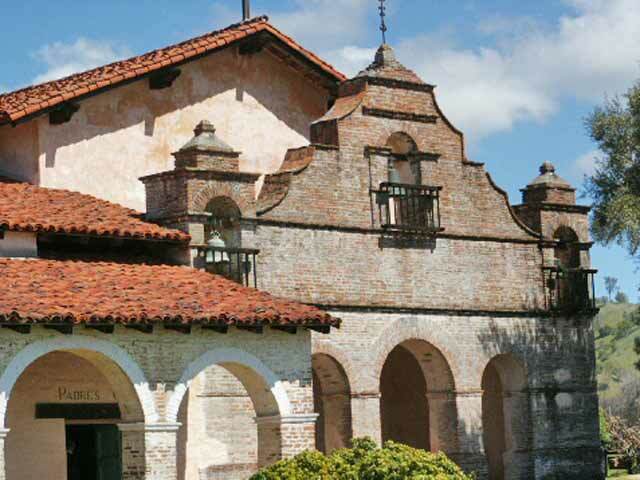 From 9 AM to 2 PM, the San Juan Bautista Historical Society Luck Museum and the Carl M. Luck Memorial Library Auxiliary will be hosting an open house at Luck Park in San Juan Bautista. The event will showcase projects of San Juan Bautista organizations and nonprofits. A BBQ lunch will be available. Funds raised from the BBQ will be used for renovations of Luck Park. For more information, click here. Hazel Hawkins Hospital invites the community to visit the newly built Women's Center on Saturday, from 10 AM to 1 PM, at 911 Sunset Drive in Hollister. Visitors will have the opportunity to tour the facility and meet obstetrical staff, as well as take advantage of free health screenings and participate in giveaways and other activities. For more info, read this article at BenitoLink.com. This will be the last weekend of the Renaissance Faire at Casa de Fruta. Hours of the festival on both Saturday and Sunday are 10 AM to 6 PM. Head over to the Renaissance Faire's website for all the details you may want to know. The Casillas Garner Family and Friends Team are holding their annual fundraiser for the American Cancer Society Relay for Life on both Saturday and Sunday (10/13), from 10 AM to 7 PM, at the old Ferry Morse Ranch on Highway 156. People can purchase pumpkins, fresh produce, baked goods, and a barbecue lunch. For more details, click here. Every year Swank Farms creates a new elaborate and crazed corn maze for folks to make their way through. They also have a pumpkin patch, a kiddie corral, pedal go carts, and other fun activities for young and old. They're open daily from 10 AM to 6 PM through October. And, this Saturday night, from 6 PM to midnight, their haunted event called Terror in the Corn, Alien Invasion will be open for the brave of heart. To get all the details, click here. 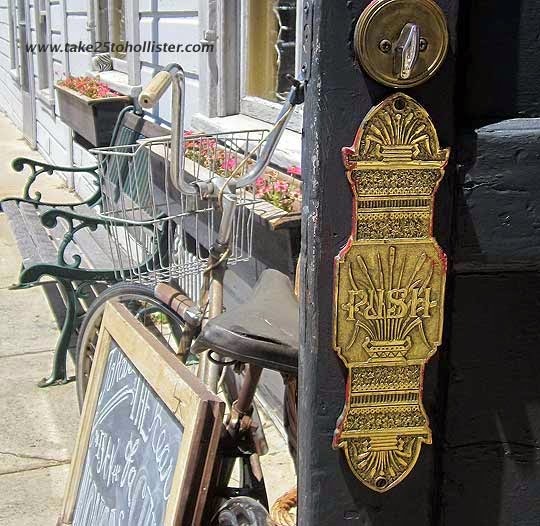 Taking place in historical downtown Hollister from 1 to 5 PM tomorrow afternoon will be a wine and beer stroll hosted by the Hollister Downtown Association. The event will provide an opportunity to learn about both downtown merchants and local wineries and breweries. Stroll participants will visit businesses and restaurants to taste samples of wines and beer. 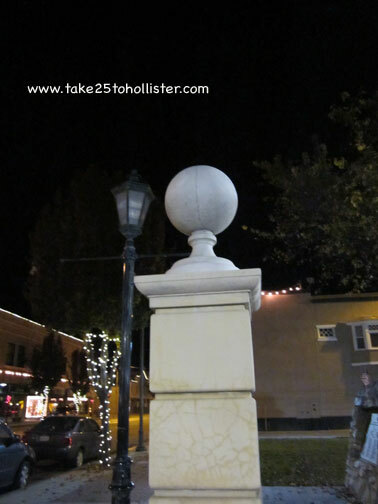 For more details, check out this Hollister Downtown Association web page. BenitoLink.com is a free online resource for local news and information. Tomorrow evening, the nonprofit group will hold a launch party to formally introduce its website to the community. 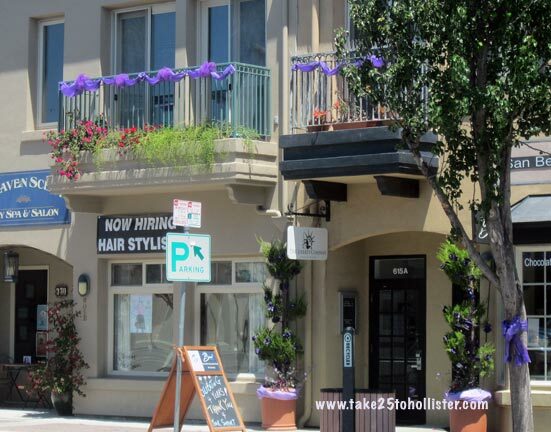 The party will be from 5 to 7 PM at the Blak Sage Gallery, 727 San Benito Street. There will be live music and complimentary food and drinks. For more information, click here. 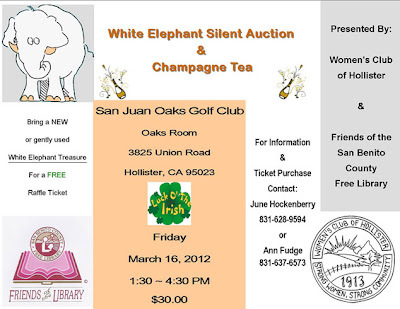 On Friday, March 16, 2012, the White Elephant Silent Auction and Champagne Tea will take place at the San Juan Oaks Golf Club, from 1:30 to 4:30 p.m. 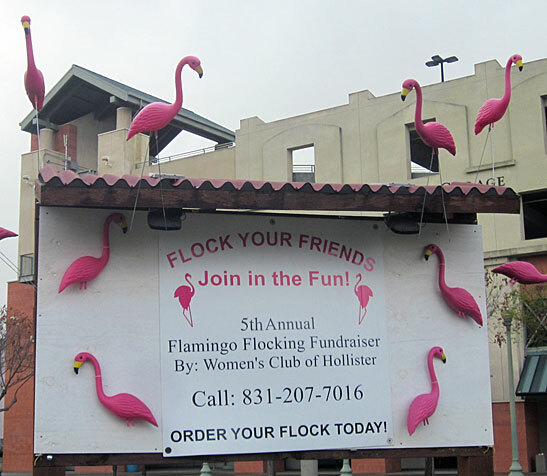 This annual fundraiser is sponsored by the Women's Club of Hollister and the Friends of the San Benito County Free Library. 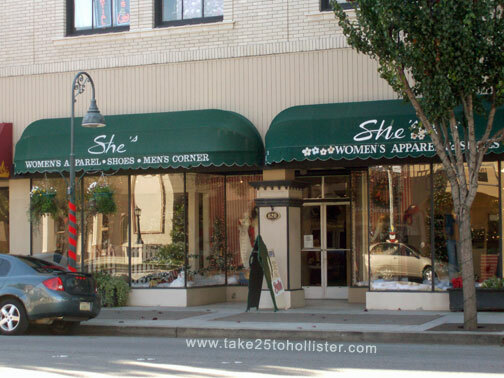 It benefits both the Women's Club Girls' Scholarship and the Friends' Book Fund. The cost is $30 per person, which includes a light buffet with champagne, tea, and coffee. And, of course, a chance to buy some interesting items. 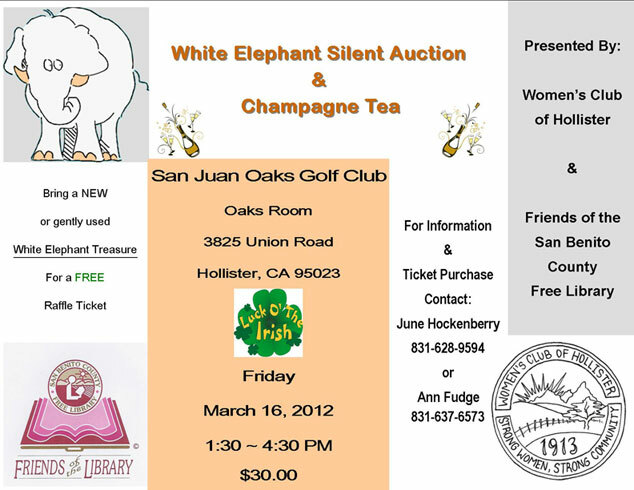 If you donate an item for the White Elephant Auction, you will receive a free raffle ticket. 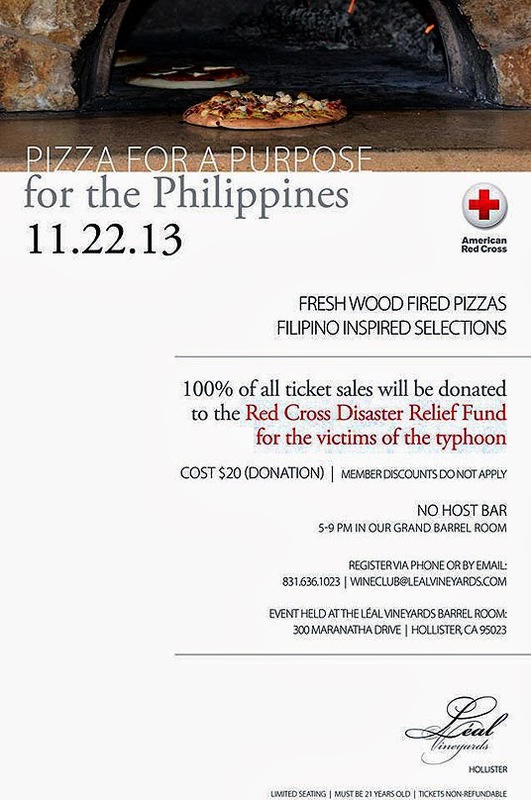 For more information or to purchase tickets, check out the flyer below. 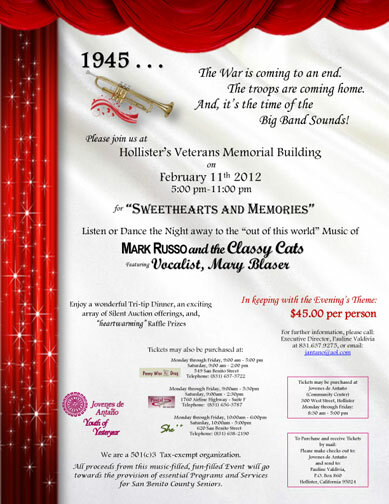 Here's something different and special to do in Hollister, come February: Listen and dance to the big band sound of Mark Russo and the Classy Cats with vocalist Mary Blaser. 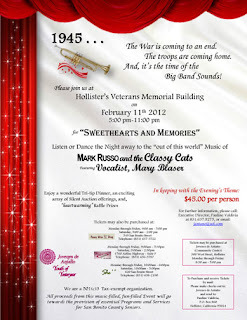 Jovenes de Antaño, the local senior citizens center, is holding a dinner and dance fundraiser on Saturday, February 12, 2012, 5 to 11 p.m., at the Veterans Memorial Building. 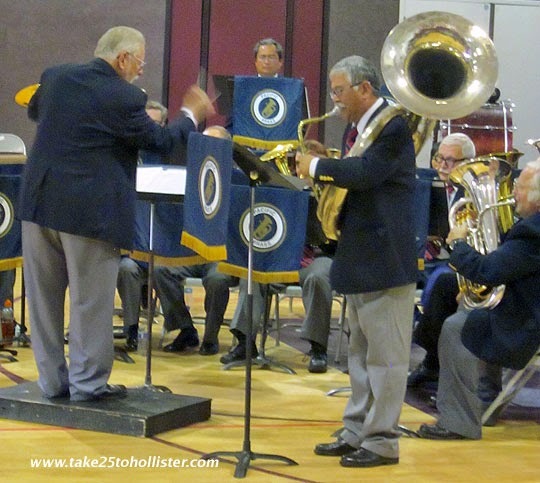 The tri-tip dinner will be served at 6 p.m. and the band will perform from 8 to 11 p.m.
To hear Mark Russo and the Classy Cats in action, check out the band's sample song list on its Web site. Lots of stuff here to check out. Don't be fooled when you first walk in. There is a lot more. Quite a lot more in the other room. 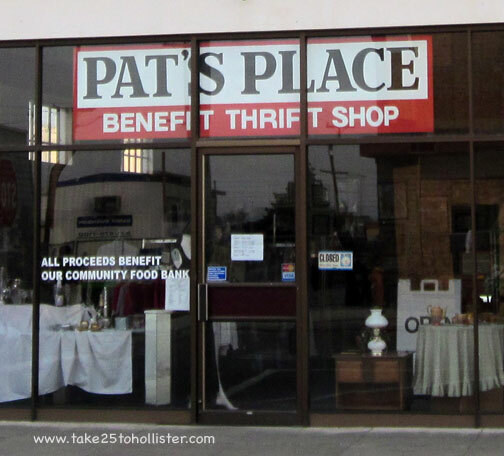 Pat's Place opened in 2009 for the specific purpose of raising money for the Community Food Bank of San Benito County. Check out this article from the Free Lance for the details. Pat's Place is at the corner of Fifth and Sally Streets. For older locals, it's the building that was once the Model French Laundry. The Bertuccio's Fruit Stand at the corner of Highway 25 (Airline Highway) and Union Road is where I saw this sign. There are probably other places where you can buy the discount card. Contact the San Benito High School Athletic Department to find out where. Go to this link of the Athletics Department for contact info. You'll also find the Baler football schedule, as well as other sports schedules. By the way: the Balers play against Oak Grove tonight at the Andy Hardin Football Field. 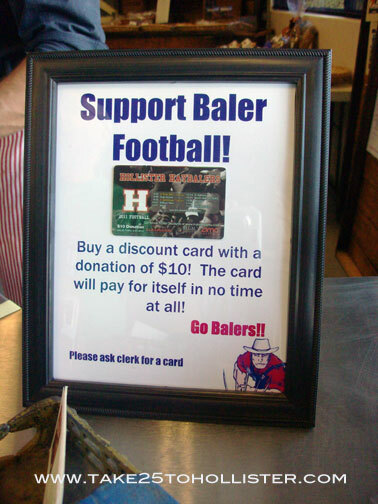 The JVs play at 5 p.m, while the Varsity team plays at 7:30 p.m.
Also, by the way: if you shop at Bertuccio's on Sunday, and you say Haybaler Athletics, the store will donate 10% of your purchase to the athletic department. 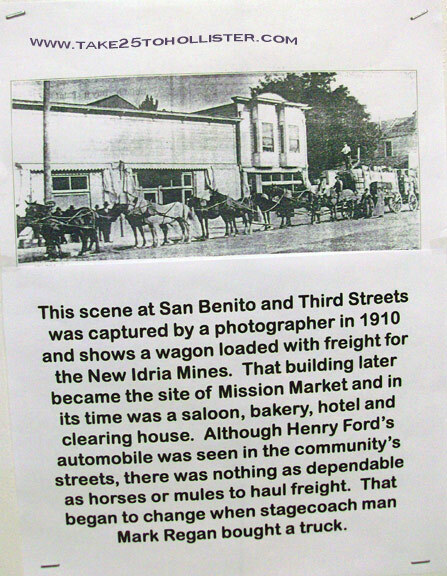 I took a photo of this "flyer" at the San Benito County Fair in 2009. Just came across the digital file on my hard drive. I wonder which side of the street this was. Speaking of history, this Saturday, August 20, the San Benito County Historical Society will be holding a fundraiser at the historical park to raise funds to rebuild the Dunneville Dance Hall. It sounds like it will be a great wingding. Wish I could clone myself so I could go. Click here for more details. More than six hours later, I still have a distinct taste of garlic in my mouth. Garlic fries. Garlic ice cream. Shrimp, mushrooms, noodles, BBQ, and sausages laced with oodles of garlic. 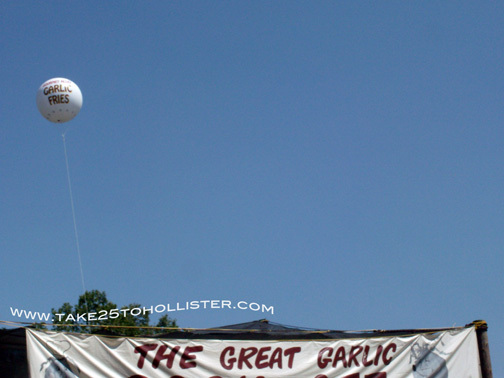 Yesterday, the husband and I drove over to Gilroy (not in San Benito County) and sampled some of the garlicky foods for sale at its infamous Garlic Festival. Consuming all that garlic was for a good cause. Really. This was the first time I attended the event, which started in 1979. I didn't know until just now that the festival is a major annual fundraiser for Gilroy's many nonprofit organizations. 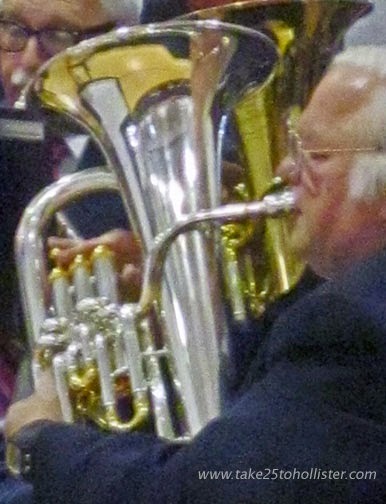 Last year, the festival raised $270,000, according to its Web site. Wow! Okay, maybe I'll excuse it for having to pay $3 for a bottle of water. The festival continues today and Sunday. I thought the garlic fries were the best tasting thing I ate. The potatoes were totally loaded with the stinking rose. As the mama would say, "Lots of people there." 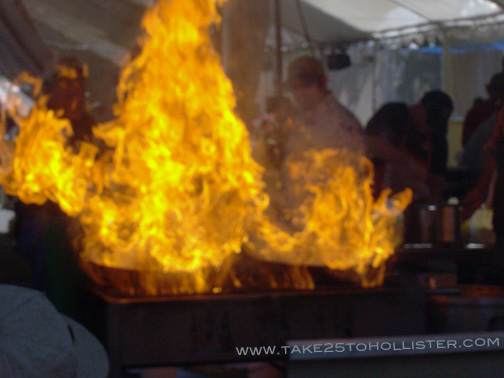 Setting the pans on fire was part of the show of cooking in front of a crowd. 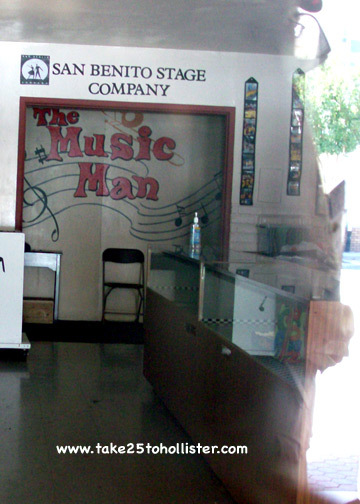 The San Benito Stage Company will be presenting the musical "The Music Man" at the Granada Theater. The first presentations will be this weekend. For more details, visit the San Benito Stage Company Web site. 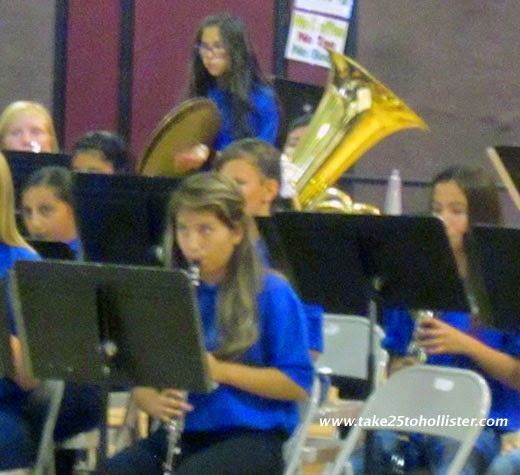 All proceeds will go to the Save the Hollister Public School Music Drive. 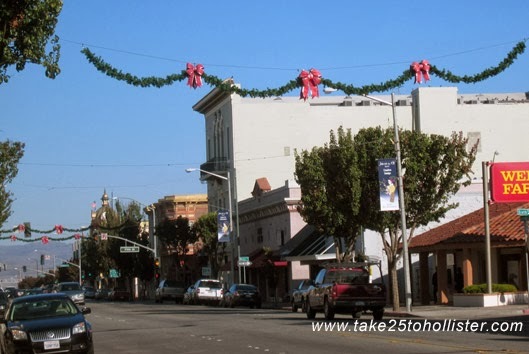 These new banners line San Benito Street in downtown Hollister. 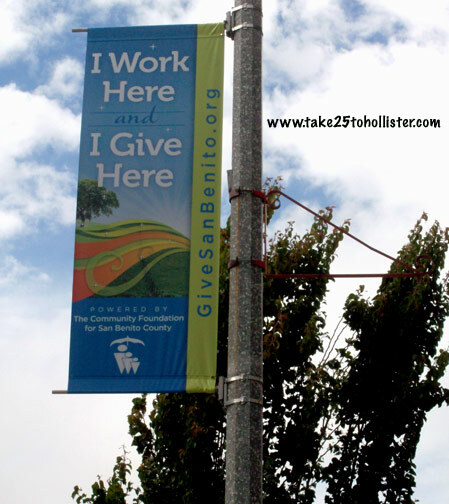 The "Give San Benito" is a fundraising campaign by the Community Foundation for San Benito County. For information, check out this link.